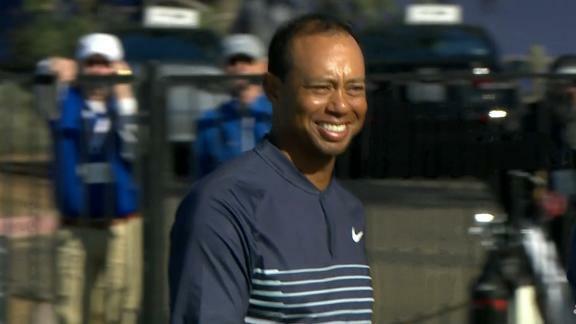 SAN DIEGO — Tiger Woods returned to competitive golf Thursday morning at 10:20 a.m. PST, but the actual moment he returned as a competitor came a bit later. On the par-3 16th hole of the Torrey Pines South Course, Woods came within a few inches of a hole-in-one. In the covered grandstand parallel to the green, amid the convergence of the well-heeled and the over-served, the appearance of the ball so close to the cup was a near religious experience. The roar was emphatic and prolonged, and when it died down just enough an undeniably local voice shouted, “Dude, that’s what Tiger brings!” as if he’d been saying it all day long and couldn’t, until now, find anyone to believe him. Golf fans root for everyone, but they root for Patrick Reed and Charley Hoffman, Woods’ playing partners for the first two rounds of the Farmers Insurance Open, out of obligation; they root for Tiger out of some deep-seated hope that he — and by extension, everyone watching — can recapture a bit of what they used to be. The problem with rooting for Tiger at this particular juncture, it seems, is that nobody is entirely sure whom they’re rooting for — the Tiger they remember, or this one? Tiger is maybe the only one who is sure. Nine months removed from L5/S1 spinal-fusion surgery, he says, “This is a different body.” He’s just now trying to get used to it. Whether everyone else can is more difficult to answer. For two days they lined up 20 deep along the fairways and hundreds deep around the greens out of curiosity and hope and prurient interest. Tiger made the cut, never a foregone conclusion, and he repeatedly emphasized that he returns to competitive golf unburdened by expectation. He’s 42 years old, and his body looks the same: strong and fit. All the age seems to have settled in his face: jowls a bit heavier, creases on his neck, the circuitous hairline. He hasn’t played since his short-lived and probably ill-advised comeback of a year ago, and nothing goes unnoticed. The assessments come without pause: Tiger is walking with more fluid strides, none of the choppiness that apparently was so prominent on this course last January; Tiger is swinging with more of an unbroken arc, none of the flinchiness he showed last year before spinal surgery in April; Tiger looks more confident, more composed, more patient. Still, there was just enough there to create hope, or at least not kill it. On Thursday, after Woods smoked his second shot on the par-5 sixth to within 20 feet of the hole, he stood next to the ball and struck the classic regal Tiger pose: left hand on hip, right leg crossed over left at the ankle, leaning on his putter with his right hand. Every crisp drive was accompanied by a chorus of “Tiger’s back, baby!” down the line from tee box to fairway to green, as if they were all singing in a round. The mere act of making the cut gave everyone just enough to keep remembering, and just enough for him to be playing on a Saturday, on merit, for the first time since 2015. Tiger seems happy. He’s engaging with the gallery, and at one moment Thursday — as a two-person hang glider swooped back and forth to watch him along the coastal holes of the South Course — he took some time to walk to the cliff and check for whales. He took time to sign autographs after both rounds, not something he always does, and even though it was 3? minutes on a Friday afternoon, it was 3? minutes he didn’t have to spend signing his name. Who’s here for Tiger? They’re all here for Tiger. The swells in the sponsor tent slurping Grey Goose and chugging on stogies the size of fungo bats are here for Tiger, as are a good chunk of the rest of them. It’s never good practice to generalize, but here goes: A lot of the people following Tiger around Torrey Pines probably wouldn’t be anywhere near this golf course if Steve Wheatcroft was paired with Charley Hoffman and Patrick Reed and Tiger was practicing his chipping game back in Florida. In fact, I’d be willing to guarantee the two guys in the tiger suits wearing “Make Tiger Great Again” caps wouldn’t have been here. Same for the dude in the “Make Sundays Great Again” T-shirt (silhouette of one of Tiger’s historic fist pumps) who screamed “Light the candle!” at Woods, presumably as a means of encouragement but your guess is as good as mine. The group following Tiger includes but is not limited to three uniformed San Diego police officers — “We’re only here for him,” one tells me — a media group ranging from more than 50 to less than 10 depending on whether it’s lunchtime, and roughly half the paying customers. On Thursday, when Woods played the hole that runs on the other side of the fence from the Scripps Research Institute (No. 10 on the South Course), employees rushed to sit and hold up their phones amid the scrub brush and eucalyptus outside the building, while several others stood on the scaffolding outside the center’s physical plant to get a free look at the comeback. Those of us who walked with Tiger during the first round were accompanied by a course marshal — late 60s, tournament-issue cap and jacket, Oakley highway patrolman sunglasses, requisite khakis, hiking boots — who approached his task with unwavering seriousness. He, and he alone, repeated the mantra “Silence your phones, please,” countless times at each hole, in a tone that made the “please” part feel less than sincere. His commitment to the bit was impressive. There were literally F-18s and Sikorsky helicopters from nearby Miramar flying directly overhead all day long and this guy could detect the distant buzz of a text message with flawless certainty. The tournament slogan is “Keep Calm; Torrey On” — again, your guess is as good as mine — but he was determined to obliterate the sentiment. If he could have removed every phone, and probably every vocal cord, within a 100-yard radius of every one of Tiger’s shots, he would have done it with great pleasure. Everything surrounding this roaming glut of humanity creates a monstrous imbalance in attention across both the North and South Courses at Torrey Pines and spawns innumerable lamentations for the miserable plight of the other 152 golfers in the Farmers Insurance Open. These young men are remarkable golfers and upstanding citizens, the reasoning goes, and they’re being almost uniformly ignored this week because of Tiger. It’s either unfortunate or unfair or too bad, when in reality it is none of those. The guys who spent the past two days in closest proximity to Tiger are perfect examples. Reed is a phenomenal player with a friendly disposition no matter where the ball lands, but the only thing I really wanted to know was why he takes so long to hit a shot. Vaccines have been developed in less time, and with less scientific scrutiny, than it takes Reed to hit an approach shot, and when he reaches the green the process is elongated by his caddie’s insistence on lying on the ground, chin pressed to the tiny blades and eyes fixed on a secret only he can see, apparently as a means of communing with the topography and improving his boss’s odds of making a putt. Reed is 27 years old and has made more than $18 million playing golf, so there’s no doubt it’s working, but still. And the most riveting thing about Hoffman, aside from his residence in nearby Poway (a fact brought up at least three times a hole) and the fact that he used to have long hair and has earned more than $25 million on Tour, is his first name, which seems unremarkable but must not be judging by the many and varied ways spectators invoke it at high volume from hole to hole. Fans lined up 20 deep along the fairways and hundreds deep along the greens hours in advance because Tiger Woods — triumphant and flawed and physically brittle — remains the only golfer able to transcend the sport. Every one of his shots is shown on the television broadcast because he is the only one who can go from bunker to bunker on the same hole — as he did on Thursday — and elicit a reaction from the crowd that suggests he permanently depressed them all. He is the only one who can, through the mere act of making the cut, conjure thoughts of a return to dominance. He is, and remains, everlasting proof we all relish the possibility of a rise after the fall more than the rise that came before it.